This post is an attempt to elevate the bean. I’ve seen the sad dishes of beans at cookouts that go home as full as they came. The bean leftovers transferred from one container to another until they are finally thrown away. We need to end bean boredom. 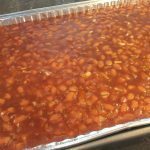 Baked beans can be pretty boring. They are standard fare at cookouts and usually come straight out of a can. So it’s no wonder people don’t go straight for the beans. A few inspired people dress them up a little while purists soak their beans and spend hours getting everything just right. Unfortunately, I don’t have hours to donate to the bean cause. I want to make a pan of beans that tantalizes. I need the sweet and slightly vinegary smell to hang in my kitchen – making mouths water in anticipation of grilled meat and sides. And I want it to be quick. And use ingredients from my cupboard. I need this to be a worthy match for the potato salad. Here’s what you need. As always, feel free to tweak the recipe for you. 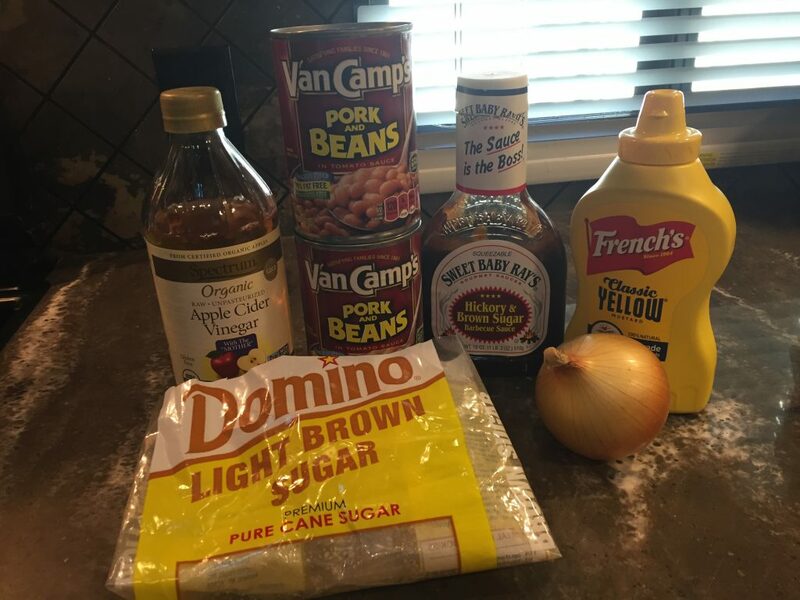 Open the cans of beans and pour into a mixing bowl. Add the brown sugar, yellow mustard and vinegar. Add the BBQ sauce and mix. Chop an onion. Heat a Tbsp. of butter or olive oil in a pot over medium heat. Place 1/3 of an onion into the heated pot. Reduce heat slightly. 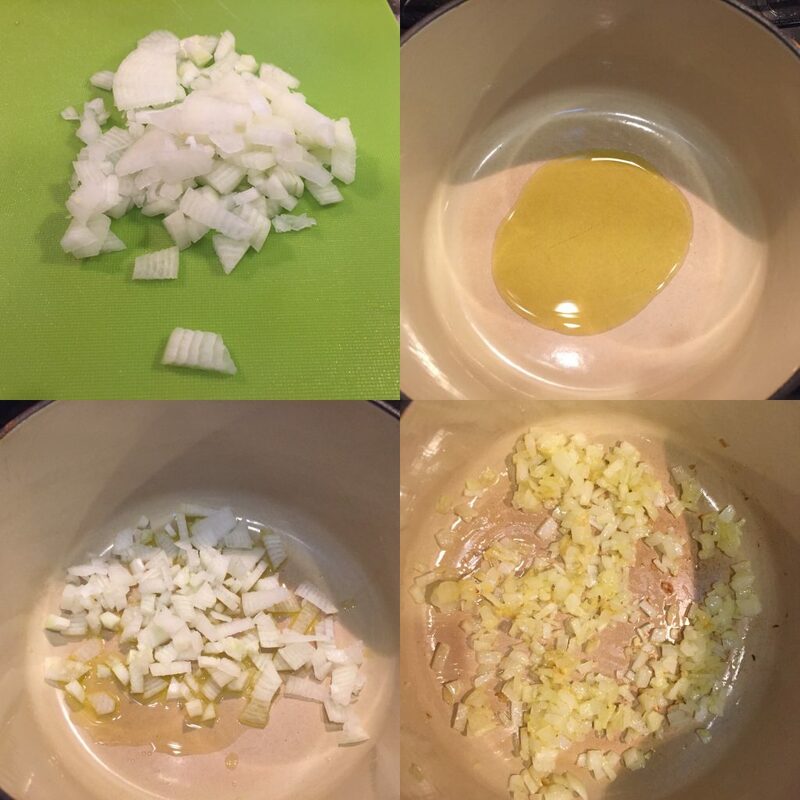 Cook onion until it softens and begins to slightly brown. Bake at 325° for an hour if possible. After that, you can turn the oven to warm or low and leave the beans in there – for up to several hours. Cover with aluminum foil to keep from drying out. The beans are already cooked – this bake is just to combine and heat the ingredients. And to make your kitchen smell amazing. You can see the onion in here. I used a disposable pan which is flimsy, especially when hot and full of beans, so I set this pan inside another pan to keep the beans from pouring into the bottom of my oven. Here are the beans after cooking them. You can see a few bubbles coming up. My family would like me to add that to really elevate these beans, bacon should be added. They love bacon. I keep real bacon bits on hand to keep from having to fry bacon constantly to sprinkle on this and that. And yes, bacon does bring in a salty flavor. So to elevate these beans one more step, just add bacon. May your bean pan be always scraped clean. May you never have bean leftovers. Enjoy! 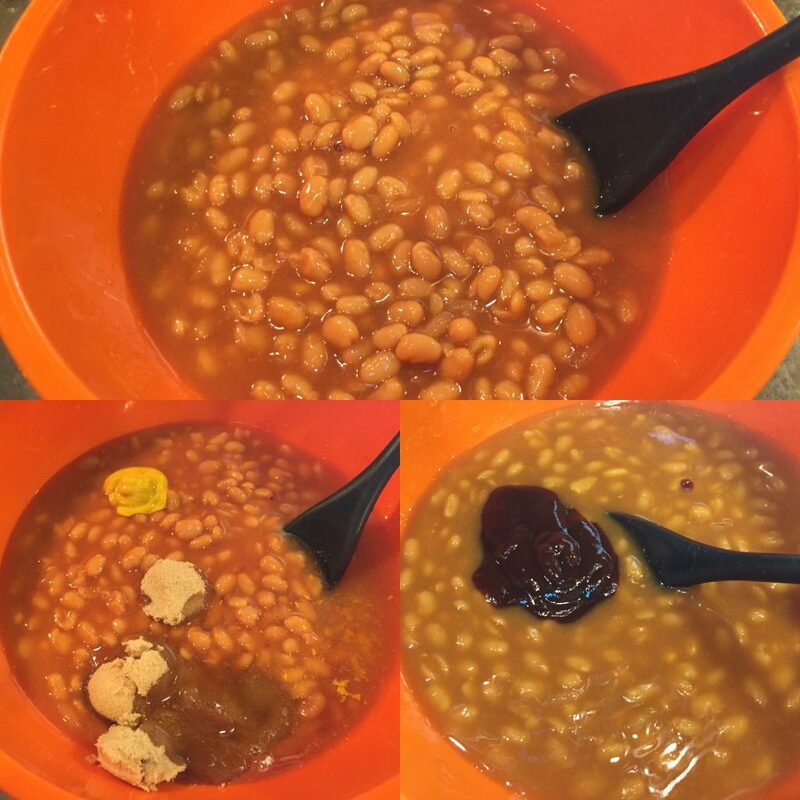 Open cans of beans and pour into a medium mixing bowl. Do not drain. Add brown sugar, yellow mustard and vinegar. Stir. Add BBQ sauce. Stir. Chop an onion and place 1/3 of the onion into a heated pan with 1 Tbsp. olive oil or butter. Turn heat from medium to medium low. Let onion cook and soften, becoming slightly browned. This may take a few minutes. Spoon onions into bean mixture. Stir. Spray square pan or casserole dish. 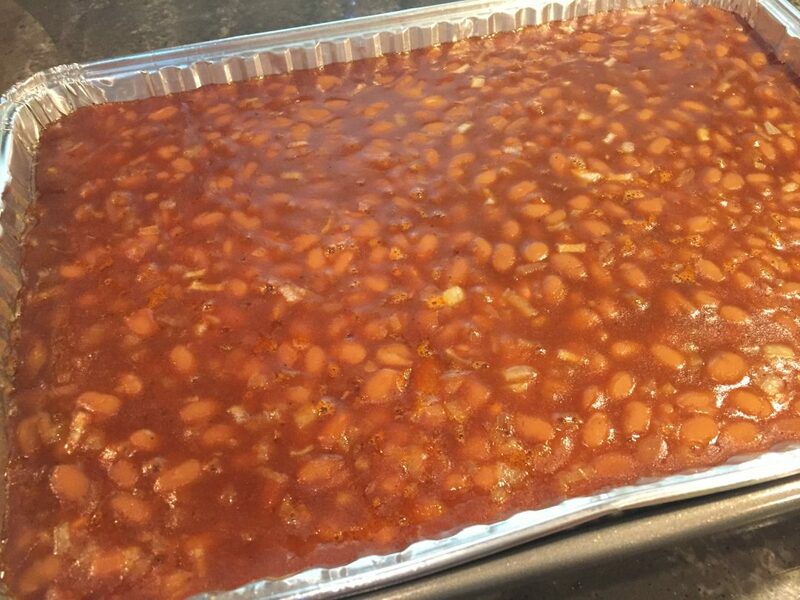 Pour beans into pan. Place in preheated oven and bake for one hour. 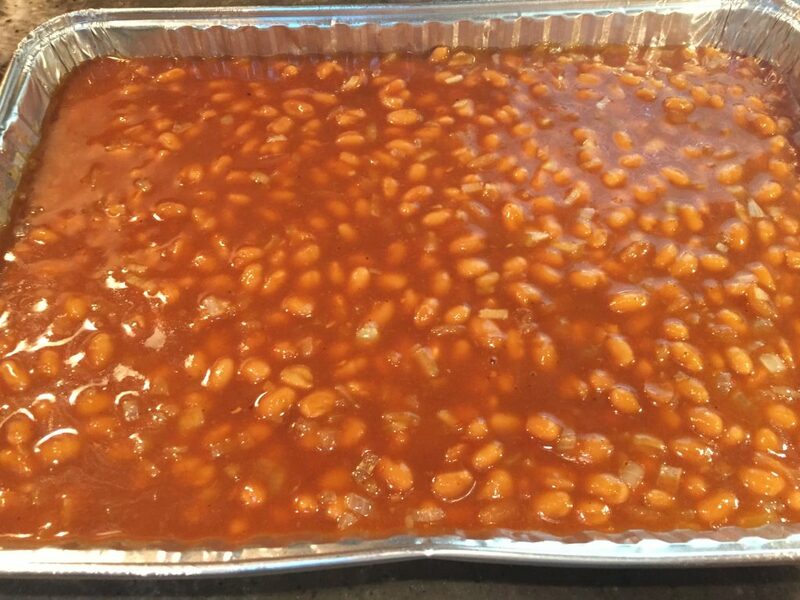 After one hour, the beans can be covered with foil and left in the oven on warm or low until serving time. My family likes me to sprinkle 1-2 Tbsp. of real bacon bits on top of the beans as they bake. This recipe can easily be doubled or tripled. Just adjust the size of the pan accordingly. If using a disposable pan, make sure to place it on a cookie sheet before placing into the oven.